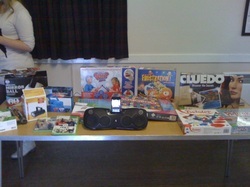 Charitable donations and various special events from our table. 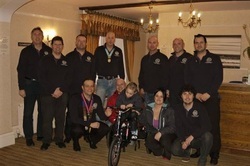 Hunstanton Round table donate a new tricycle to Tyler from Docking. Tyler’s new Trike will allow him to have a break from his wheelchair and ride with all his friends at school. Riding the Trike is wonderful exercise for Tyler; it builds up the strength in his legs. 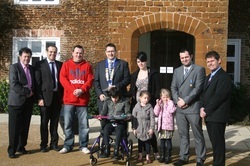 We were delighted to see Tyler riding the Trike at Heacham Manor when it was presented to him on Sunday. take part in the Round Tables National Sporting Weekend. we were joined by guys from North Walsham and Dereham, also from area 6. Birmingham saw over 500 tablers compete in a number of sprts, before a Gala dinner and a casual few drinks to wash it down! 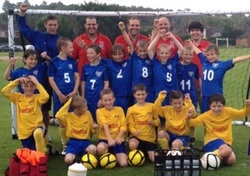 Hunstanton were the highest achievers of area 6, coming 3rd in the 5 a side football. The finale to the sports for the day was the Tug of War, which was a joint effort from North Walsham and Hunstanton. A great weekend had by all, and we hope to see the National sports weekend back to the founders area in the near future! 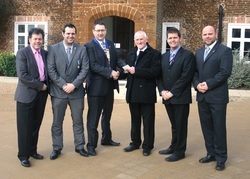 Hunstanton Round Table Chairman, Kevin Waddison, carries the Olympic torch! Kevin was nominated to carry the Olympic torch, on behalf of the Hunstanton round Table, because of his voluntary within the community. 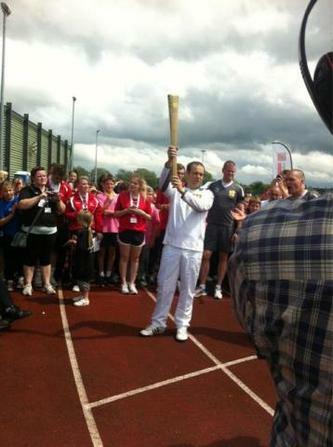 Kevin carried the torch along part of the running track at Lynn Sport, then into the car park, where he was able to conquer his overexertion on a bus ride to Sandringham so the next torch bearer could take over. 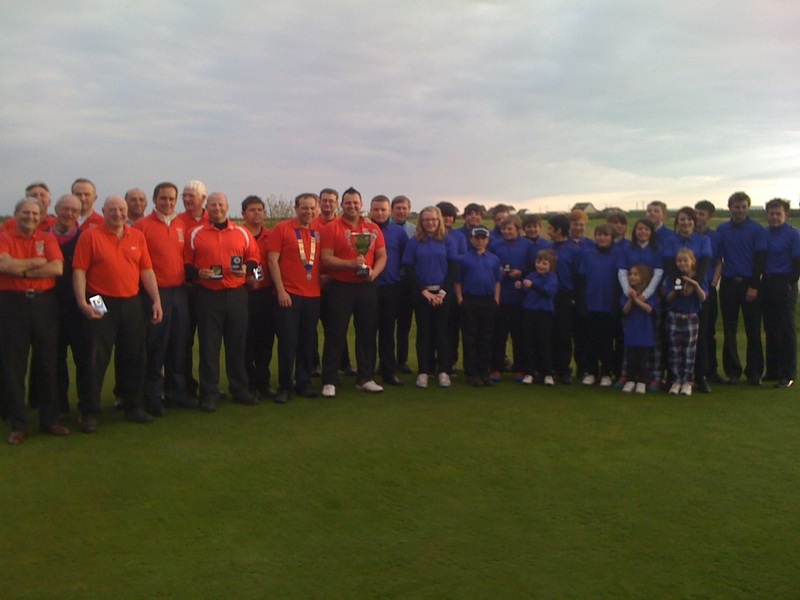 elite squad junior golfers faced up to the Hunstanton Round Table for The Richard Searle Trophy for the fourth year running in a Ryder Cup four-ball betterball format. The juniors were looking for revenge after the 6½ to 3½ TRASHING! last year. But once again they tried and failed to over come the more fitter!! And skilful!! Table lads who were very sporting towards there young counterparts and in no way as some of them said did we ever try to put them off or push them in to the bunkers and ditches!! As usual the round table lads showed no mercy to those pesky kids!! The captains of both teams start the match off Both sides were evenly-matched in the opening stages, however the Hunstanton Round Table team dominated the later matches, and finally took the match 6.5 points to 4.5 out of 11.to retain the Ryder cup which was gracefully and in no way provocative!!! Lifted aloft! 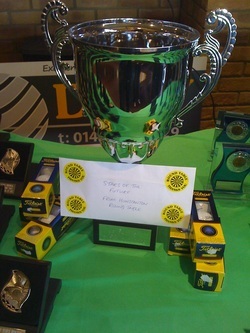 by team captain Joe bates to a massive cheer and a few boos from the kids parents!! They Really need to grow up!! Thanks go to to Joe Bates (Round Table member), Ray Stocker (PGA professional and table member) and his assistant Luke Harris for pulling the 2012 event together. 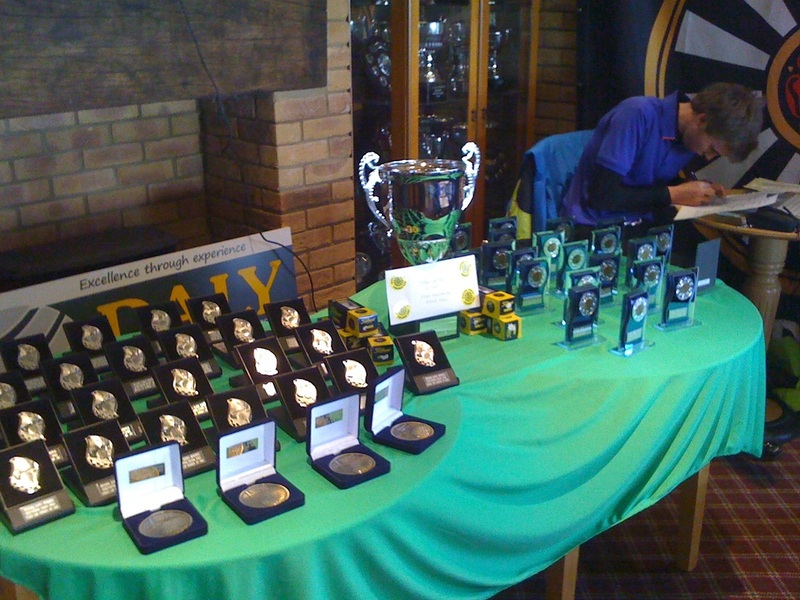 Additional prizes: 9 hole fourball better ball stableford score, Juniors, with 18 points Joe Long and James Agate; Round table, with 21 points Paul Searle and Max Sowerby. 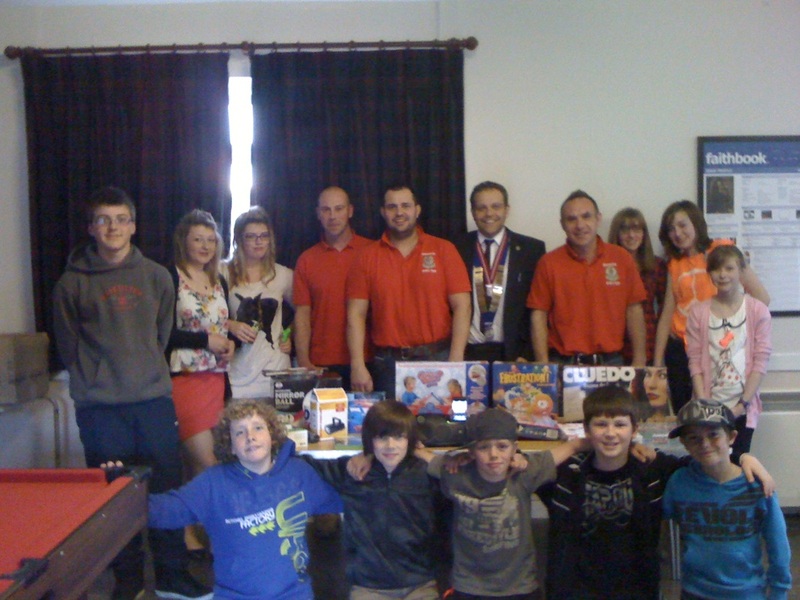 Hunstanton round table presents Heacham Youth Club with games and toys. We are delighted to be able to provide the youth club with some much needed equipment to keep the club fun and exiting for the village children. Tracey from the youth club asked if we could help fund some new toys and games, the children got together and wrote a wish list, we are happy to present the club with a number of items from the list. 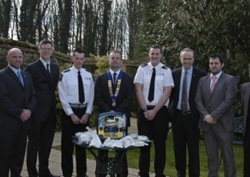 Hunstanton Round Table present a suction unit to St John’s Ambulance. We would like to thank St John's for their continued support of the Round Table’s clifftop fireworks display and Christmas Day swim. The suction units are used to clear airways of blood, vomit and saliva, allowing patients to breathe and preventing choking. 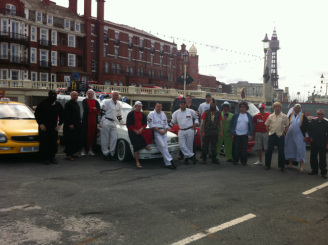 What a great success, all cars made it (just) and some £2,000 was raised for The Lynn News Young Carers Appeal. Over 1000 miles were completed on out trip from Hunstanton and back via Bournmouth, Blackpool and Witley Bay. The hearse... er... Ghostbusters car had its problems but none such as bad as the Starskey and Hutch car, which growled, limped, smoked and coughed its way round each long slow mile of the event. Next time out our crime fighting wigged wonders need to up their game! Interested in joining our next road trip to Munich beer festival 2013? Please contact us through website. Push play on the photo below to watch the slideshow. 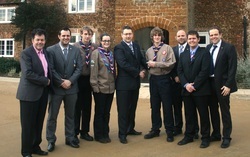 Hunstanton Round Table presented a cheque for £400 to Explorer Scouts (Kings Lynn) as appreciation for their continued efforts in assisting with Round Tables Bonfire Night in Hunstanton. Scout leader Janice Minns thanked Round Table for their donation which she said would help with essential running costs and future purchases. Anyone wishing to join the Explorer Scouts should call Janice Minns on 0844 4142639. 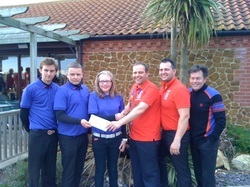 Hunstanton Round Table present a cheque for £1,450 to The Chloe Newman Fund. Approx £1,100 was raised by family and friends participating in Round Tables annual Christmas Day Swim and this was topped up by a further £350 from Round Table funds. Chloe suffers from Blindness, Cerebal Palsey and Autism as well as other problems and is trying to raise funds for a new play room and equipment. She also has a fundraising facebook page with almost 500 followers. Chairman Nathan Daly commented, ‘We are really pleased to help Chloe, she desperately needs help and we wanted to do all we could. We also thank the large number of swimmers the Newman family brought to our event this year to fundraise and we wish them all good luck achieving their target. Nick Blake Receives a cheque for £250 from Hunstanton Round Table on for Dylan who is an enthusiastic Three year old child from Heacham with Epilepsy and Autism. 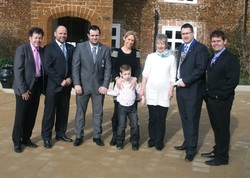 The money will go towards a new Multi Sensory Environment Machine which should enable a better life for Dylan. Round Table Chairman Nathan Daly said, We are always looking to help people like Dylan within our local area and we are delighted to help.